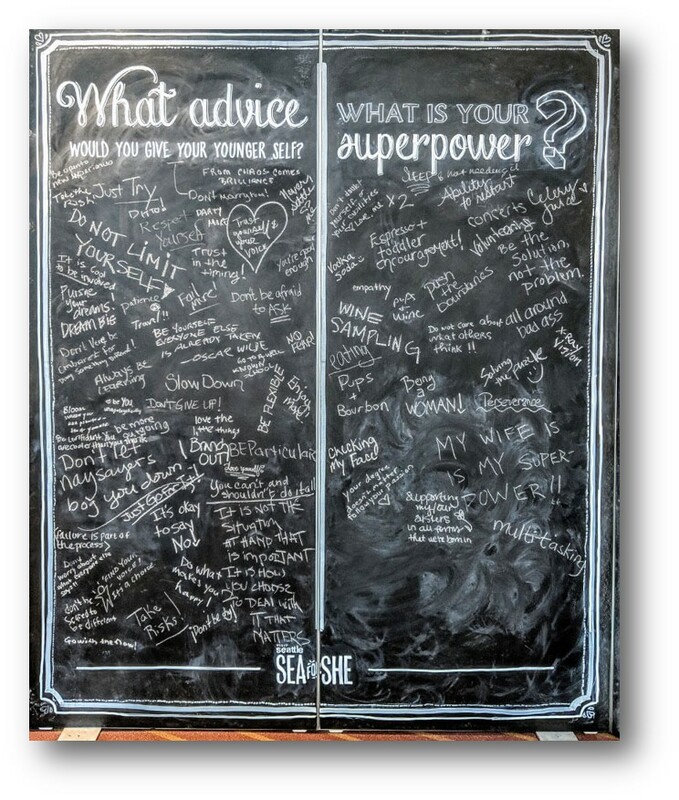 These chalkboard illustrations were created for the SEAforSHE activation at PCMA 2019 Convening Leaders to highlight strong female leaders in Seattle. Attendees were also encouraged to provide their words of advice. As a city of inclusivity, it’s no wonder that Seattle is home to such a strong network of female leaders. Seattle has the highest share of women-owned businesses in the country and it’s also a place where women hold prominent leadership roles throughout the community. 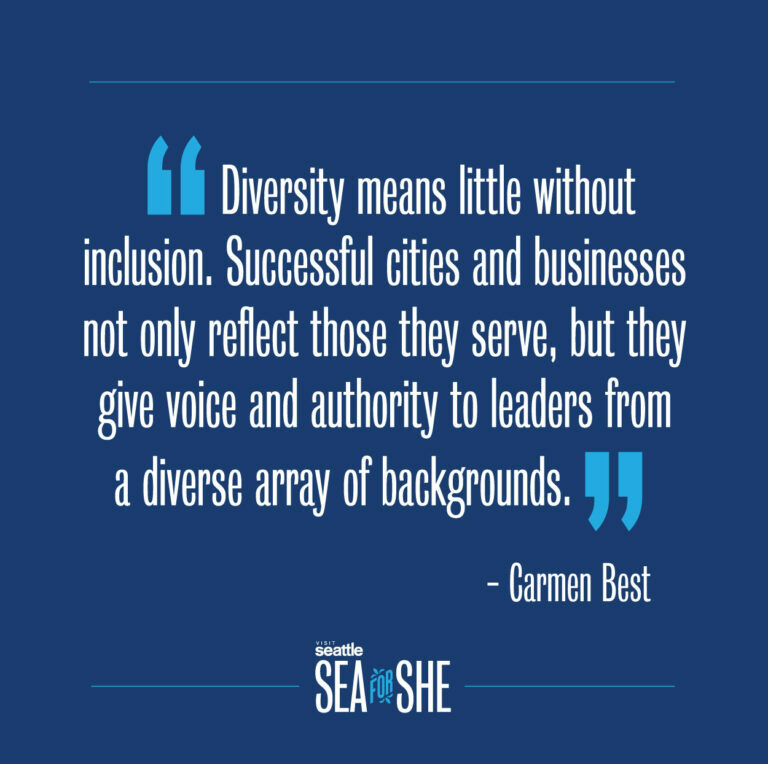 In order to celebrate these strong female leaders, we created an initiative called SEAforSHE to support the women in our community and showcase Seattle as a place that welcomes women with open arms. With almost 30,000 women business owners, Seattle is ranked the second best city for women entrepreneurs. 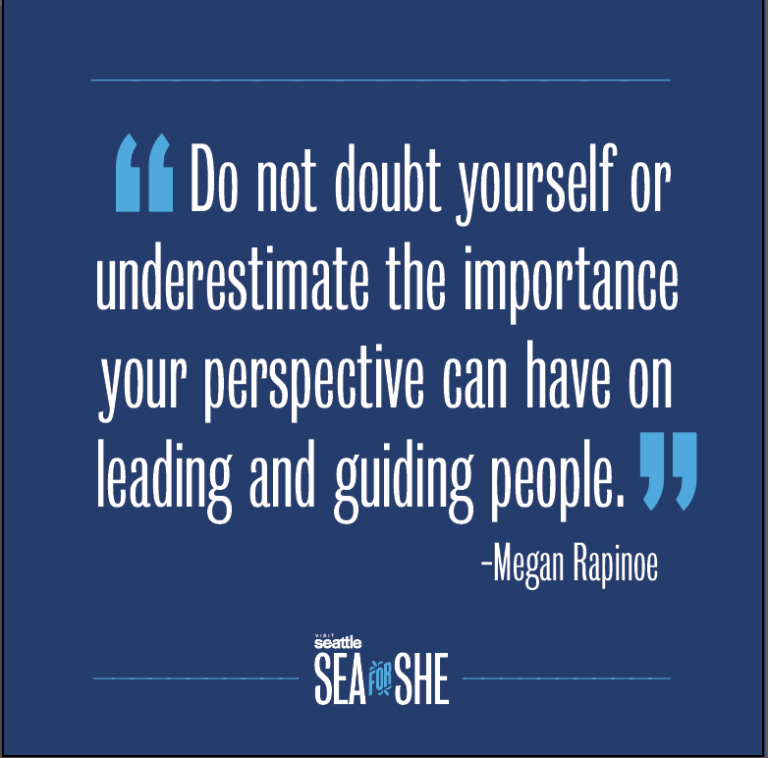 Women in Seattle have multiple seats at the table, are breaking through the glass ceiling, and are leading our city. 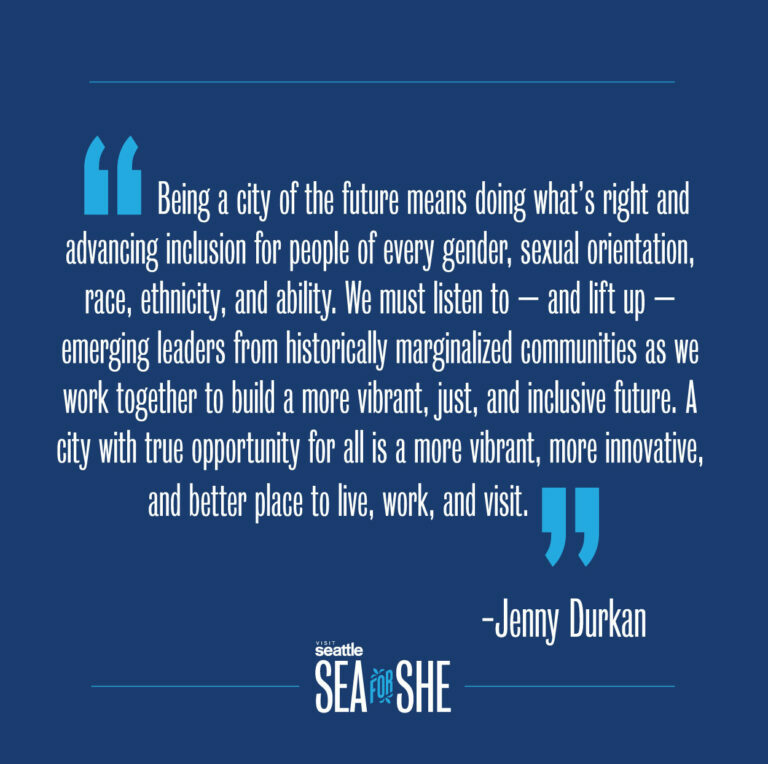 Female city council members occupy more positions than their male counterparts, 2 to 1, and Seattle just swore in a woman (and proud lesbian) mayor, Jenny Durkan. 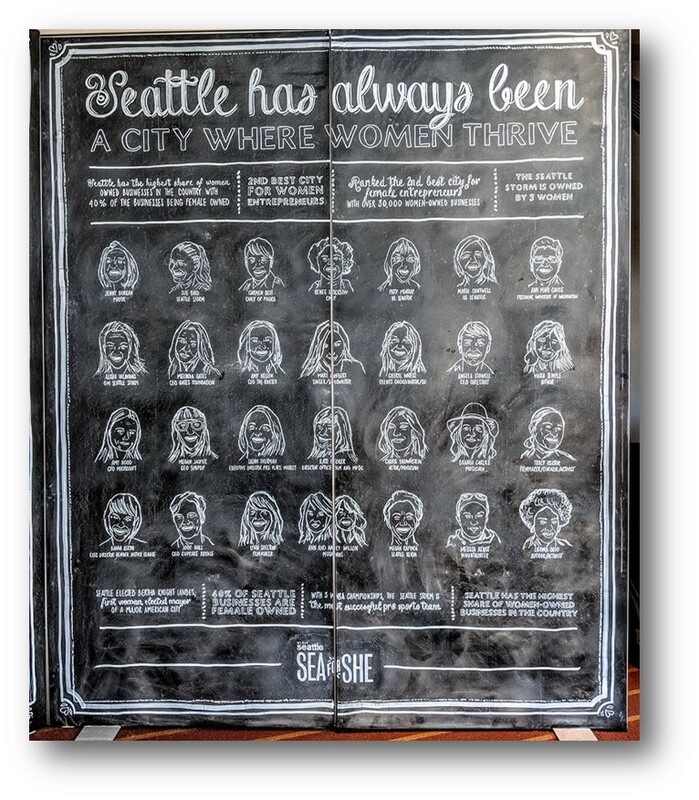 At PCMA Convening Leaders 2019, Visit Seattle hosted an activation at the Ascent Studio featuring our SEAforSHE campaign celebrating the strong female leaders of Seattle. Visit Seattle is a founding partner of the PCMA Ascent program which promotes diversity and inclusion across the business events industry. Renee Erickson is a James Beard award winning chef, and owner of several restaurants throughout Seattle. She is also an author of a cookbook that highlights the fresh seasonal food in the Pacific Northwest. Amy Nelson founded The Riveter in Seattle, which offers work and community spaces built by women, for everyone with five locations along the West Coast. Nelson is a former corporate litigator and political volunteer, and mother of three. Melinda Gates is co-chair of the Bill & Melinda Gates Foundation, headquartered in Seattle, which seeks to improve equity in the U.S. and around the world. Melinda works to empower women and girls to transform the health and prosperity of families, communities, and societies. Chief Carmen Best has been with the Seattle Police Department for 26 years and currently serves as Chief of Police. Chief Best is a Washington native, and is the first African-American woman to lead the department. Sue bird is a three-time WNBA champion and four-time Olympic gold medalist. Bird was drafted in the first round of the 2002 WNBA draft by the Seattle Storm where she’s spent the last 16 seasons. Ana Mari Cauce has been serving as president of the University of Washington since 2015. Cauce is a Cuban immigrant who is committed to furthering the university’s mission and champions access to higher education. Brandi Carlile is a three-time Grammy award-winning singer-songwriter from the Seattle area. As part of the LGBTQ community, Carlile also speaks out about issues of addiction, immigration, and bullying. Saling leads both citywide and short-term business development strategies for Visit Seattle on behalf of the Washington State Convention Center (WSCC) which broke ground on an exciting additional facility, the Summit, which will be open for business in 2022. Grammy nominated pop soul artist, Mary Lambert, teams up with James Beard Award winning chef, Renee Erickson, creating a gorgeous music and food pairing at Seattle’s Bar Melusine in this episode of #TurningTables. Filmmaker Megan Griffiths is one of the contributors to this creative city. Read on for a look at the city through her artistic lens. This Seattle Reign FC midfielder, who won a World Cup with the US national team in 2105, dishes about her first impressions of Seattle—and why she still loves it here. A morning of inspiration, encouragement and motivation as panelists discuss how their involvement in sports helped drive and develop them to become the leaders they are today. Women have always been a huge part of Seattle’s music scene. Check out Shaprece performing live from inside the Seattle Great Wheel, and Katie Kate performing at the Seattle Art Museum.